Saying that you’re ‘camping’ in a yurt at MacGregor Point Provincial Park, is generous, it’s actually more like glamping than camping. You won’t freeze your toes off overnight, wake up soaked in melted snow or struggle to start a fire! You won’t have to set up a tent, chop your own wood, or eat grubs to survive that is camping luxury. These amazing structures offer the winter essentials, shelter and warmth, and plenty of both. 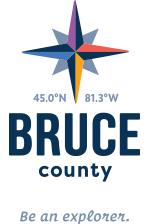 Just bring your food, a sleeping bag and up to five people for an amazing way to experience Bruce County. Traditionally used by nomads in the steppes of central Asia (think Mongolia), yurts are circular, semi-permanent, tent-like structures. The yurts at MacGregor Point Provincial Park are modern versions of these ancient dwellings. They are eight-sided, 16 feet in diameter and feature a wooden, plywood floor. Inside you’ll find an electric heater, electric outlets, fluorescent lighting, four chairs, a table and two sets of bunk beds that sleep up to six people. Outside is a fire pit, a kitchen shelter, picnic tables and a propane barbecue. Basically, everything you need for a weekend away. Remember to bring your own bedding, cookware and any other personal items you think you’ll need. A nearby comfort station provides drinking water, flush toilets and hot showers. Ski, Skating, and Snowshoe Trails! Don’t worry about being stuck inside your yurt all weekend long, there’s tons to do at MacGregor Point Provincial Park. First and foremost, start your day off properly, with bacon. If you need to stock up on your way in, swing by downtown Southampton Meat Market, or Port Elgin’s Hoof’n It off Highway 21 to grab some. Then check out the cross-country skiing trails. With 3.7 kilometres of trail through snowy trees, this is a great way to enjoy the sights and sounds of the park. The Deer Run trail is a perfect scenic trail for beginners. If you don’t have skis, swing by Thorncrest Outfitters in nearby Southampton to pick up some rentals. One of the greatest things about winter glamping at MacGregor Point Provincial Park is its proximity to anything you could ever need while on your getaway. Southampton and Port Elgin are minutes away, so if you want to get back to civilization for lunch, it’s no problem. Lord Elgin Fish & Chips, Allan’s Fireside Grill and The Queen’s Bar and Grill are a few popular options. In the afternoon, be sure to check out the park’s skating oval. This well-maintained rink is so cool; winding its way through the forest just off Lake Huron. This rink is more of a stroll through the woods than a traditional skating rink. And there’s even a hut to lace up those skates or warm up in! Then, for some incredible scenery, check out the Huron Fringe Boardwalk for a great view of Lake Huron. After a day spent burning calories it’s time to replace them. And nothing is better than a home-cooked steak on the barbecue. Port Elgin Hoof’n It or Southampton Meat Market is your best local option for grabbing some juicy steak. Next, gather around the campfire for some s’mores and stories. What did we tell you? This isn’t camping. It’s glamping.